Product Description The Queue Cellstar CO2 water-jacketed incubator features digital set points with digital LED display for temperature and CO2. The Cellstar allows the user to set temperature, control temp, and overtemp control. Visible and audio indicators provided warnings for overtemp, door ajar, power failed and low water jacket levels. The audible alarm has an audio silence/reset feature. 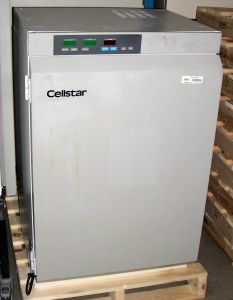 The Cellstar has a stainless steel interior including chamber, shelves, and shelf supports. This allows for easy cleaning and thorough decontamination. The exterior door-heater helps maintain heated temperatures and reduces condensation on the inner glass door to maximize chamber visibility. Temperature range is 5C above ambient to 60C. CO2 range is 0 to 20%. Humidity range to 96% at 37C, however, it is not controlled humidity.